Unless you are some kind of language genius “What can I say, I have a good ear for languages” annoying kind of person, learning anything from Russian to Tahitian in 8 weeks, you’ll need to take Norwegian language classes. There are many schools and institutions in Norway giving such classes. Some are public such as Rosenhoff (this is under the Oslo kommune), some are private such as Alfa Skolen, and others are something in between such as Folkeuniversitetet (subsidised by the State and available all over the country). If you go for the public classes then be prepared for some testing. Yes, even though you tell them you don’t know a single word of Norwegian they will still test you on your level, as ironic as it sounds. The first test I had was a lady who asked me to copy a text by hand as fast as I could. I didn’t understand the point of this exercise so I started asking all sorts of questions. “Your time starts NOW” she said when pressing a timer. WTF, I started copying the text as fast as I could and when I was done she stopped the timer and said “Well, now I know you can read and write. You just got up one level”. Oh my oh my, so this is how it works. What happens is that levels are different for immigrants who cannot read or write in their own langauge, those who can, those who have a university education, those who can read and write in several languages. Then on top you have German speakers who can basically read and understand the substance of most Norwegian texts without having attended any classes. So you might not be as “beginner” as you thought. I still remember my first Norwegian language course, it was given by a vegan metal head. She was not exactly the best teacher in the world, and every time we asked her a question about a word or a grammar rule she would roll her eyes kind of saying “you guys are so dumb”. Learning a language makes you feel dumb, that’s for sure, so be prepared to feel and look dumb most of the way. When you ask questions to your teacher about something he/she repeated 20 times already, when you try to speak and realise saying my name is.. what is your name, how are you is all you are able to recall from all these hours looking at your books. When speaking 5 minutes in Norwegian in party and feeling exhausted. When failing to give the right tone to a word, failing therefore to make yourself understood although you repeated the same word 7 times. Or when forgetting to pronounce a long vowel before a single consonnant and saying happily that you joined a pikkekor instead of pikekor. Well well, making mistakes and looking a little idiotic is part of the learning process. By the time you’re able to ask for someone’s name and tell them yours you learn that there are two official languages in Norway: bokmål and nynorsk. This is linked to Norway’s history, as the Danes came to occupy Norway Bokmål is a norwegianised and more understandable version of the Danish Language (previously called riksmål) while nynorsk (new Norwegian) is a written language which integrates many different pre-Danish dialects. You will also soon realise that Norwegian language has an unbelievable number of dialects. I guess as people used to live very far away from each other, each valley, fjord and village developped its’ own dialect. Diversity is fantastic when you think of it, but as a foreigner learning Norwegian it doesn’t look fantastic at all. It’s like making it to top of the first hill and realizing there is a chain of very high mountains ahead of you: no matter how well you master the language they are teaching you at school (bokmål) you will for sure find yourself in some place where you don’t understand what people are saying. Like Molde, Stavanger, Malmø (Yeah, Swedish, but we’re expected to understand that as well) or Tromsø. Or you might have to read and understand an article or an email where people write in nynorsk. As they are both Norway’s official languages both can be used, except that only bokmål is taught to foreigners unless you go to much higher classes. And that is kind of a shame, we should be learning equally both official languages if you ask me. To all the cynical out there, it is possible to make Norwegian friends, especially since you live in the country where most of them are gathered. And very important: you need to speak to them in Norwegian, preferably from the moment you meet them otherwise it will be too easy to switch to English. I know it sounds tough, but I am afraid this is the fastest way to learn Norwegian (it is called practising). Or find a Norwegian boyfriend/girlfriend with whom you will speak in Norwegian. If you already have one and you have been speaking English or another common Language since the beginning, you will have to force the Norwegian language in your relationship. This will be irritating for him/her for a few weeks and then it will be totally fine. Because suddenly you’ll be able to participate fully in parties, with his/her Norwegian friends and family, so it is definitely worth it for both of you. Grammar is one thing, but the most important is to make yourself understood in whatever social situation you are forced into: work, parties, shops. All these require different attitudes and vocabulary so you will not be able to stick to your books only. Remember there are many things a language course will never teach you: that there is something called Kebabnorsk, spoken by the youth and the immigrants (not sure kebabnorsk is a nice word, probably not). That you can say “as” after about just anything, and that the real deal is not fy søren but fy faen. Learning a language takes a long time and Norwegian is no exception. At some point you’ll start getting these few words that make all the difference if said at the right time “så koselig” “så spennende” and you might seem more fluent than you really are. See How to Pretend to be Fluent in Norwegian. When I stopped going to norskkurs I promised myself I would read articles from Norwegian newspapers every single day, learn 5 new words per day and I even started a Norwegian novel by Erlend Loe (an easy and funny read, I recommend it). But of course that discipline lasted 5 days because you know, work, friends, family, travels. We are busy. So my advice if for you to find something you like, those things that will make Norwegian language become part of your daily life, not a duty like School. In my case it is comic books (Pondus, Christopher Nielsen) and recipe books but it can be anything you like: sports, tv shows, news (www.klartale.no for easy-to-read news in Norwegian) but this will help you get more vocabulary and keep in touch with the language even though you don’t have a lot of people to practice with. For those of you having a good visual memory it will also decrease your grammar and spelling mistakes. In the imaginary and best version of my life I start reading Ibsen, go to a play and understand everything. Haha well. Another tip if you want to make it: don’t expect too much from yourself, don’t be afraid to make mistakes, and when the time is right, take another class to make sure you don’t end up being here for 10 years still not knowing when to use “hans” and “sin”. (I still don’t). And remember that it could be worse, you could have to learn Danish, potentially one of the hardest languages in the world to learn for foreigners and even for Danes. 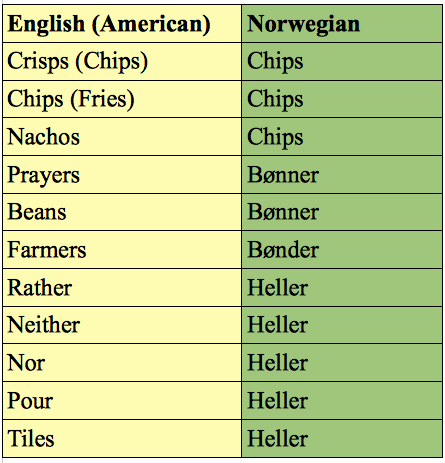 And also much more expensive to learn than Norwegian (think of all these potatoes you’ll need to buy to shove down your throat to speak proper Danish). Norwegian people are usually quite forgiving when it comes to listening to a foreigner speaking with a funny accent. Some will get impatient and switch to English. Well, I never said it was easy, and remember, giving up is not an option. Once a friend told me that there is nothing to be ashamed of by feeling stupid on the way to learning Norwegian. What you should be ashamed of is to have lived in a country for many years without speaking a word of it. Whoever you are, good luck to you! Nice article! 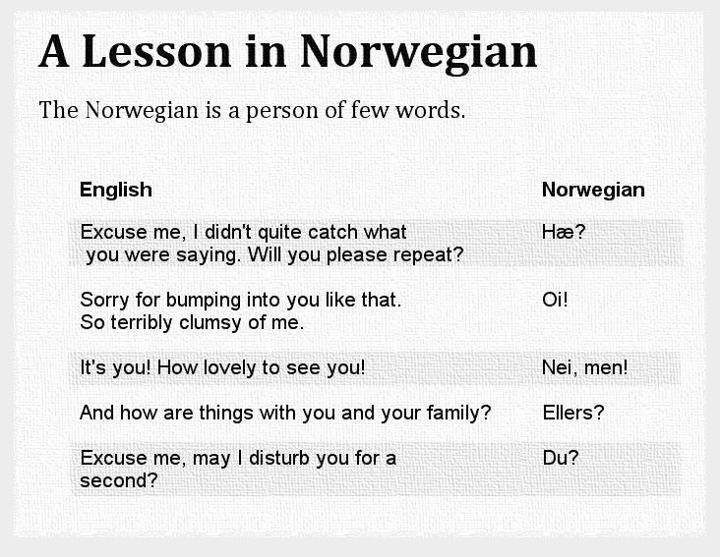 1 tip to learning Norwegian fast…be in love with a Norwegian. Love can conquer all and it helped me to become fluent in about a year. Most Norwegians are cool about language mistakes especially if they know you are learning….even when I was giving business presentations and made slip ups it just usually gave people a reason to have a laugh and usually with me not at me…plus, the learning part is a lot of fun, like by wife told me once to go to the store and get some “morgen brød”, and the female baker telling me “oh, I cant give you that, you have to make it yourself”. One way to meet Norwegians is to call them from the airport and tell them you are a long lost cousin and if they could pick you up to stay with them for a few days…learned every Norwegian swear word pulling that trick a few times. The pikkekor is just one way to make that confusion. I needed a pickaxe one year, and didn’t know it was called a hakke. But I did know that axe was øks, so I tried pikkøks. Ouch. I had to learn Norwegian……. ! Wow, you write so well! You have such a good grasp on the issues, and all the subtleties, and you convey it so well. And you do so in English in an exemplary fashion even though it’s not your native tongue. Formidable! Et merci. What a nice blog you have, girl! 🙂 I lived in Bergen 12 years ago, after all this time I thought I had forgotten it but now that I’m learling german I surprised myself saying “vann” instead of “wasser” and “fordi” instead of “weil” so I think I knew more than I expected! 🙂 Keep writing this articles! Thank you for an interesting and humorous posting! I ought to say that your “Heller” entries in the first table are not entirely correct. Neither nor reads “hverken eller”, “hverken heller ” is a writing error. There is also a difference in pitch accent (http://en.wikipedia.org/wiki/Pitch_accent). You should not be worried about “sin”. The “sin”, or more precisely the “garpegenitiv” is used by Norwegians who can’t write. Se for instance http://www.finnerikvinje.no/blog/?p=11381. Your assertion that “The “sin”, or more precisely the “garpegenitiv” is used by Norwegians who can’t write.” is not only totally subjective, it is completely wrong. Indeed. Take a look here, for instance. Jørn: “Sin” is not only used as a his genitive. Compare “Lars vasket bilen hans” (whose car?) and “Lars vasket bilen sin”. You are right. I am fighting Mr. Garp here. “Sin” (m. sg. ), “si” (f. sg. ), “sitt” (n. sg.) and “sine” (pl.) are the genitive case of “seg”. “Seg” is the reflexive pronoun, cf. “sich” in German, which is lost in the Ingvaeonic branch of the Germanic languages (to which e.g. English belongs). A rough translation is that “hans” means “his” and “sin” means “his own”. “Sin” is only used as genitive because it is a genitive. Hence it cannot be used as anything else. “Sin” is also sometimes used as a particle that substitutes for the genitive -s suffix, e.g. “Ola sin bil” instead of “Olas bil”. This use of “sin” is not considered a good practice, though one can make a case that it must be gramatically correct, and it is certainly also used in this manner. However, this does not mean that “sin” is normally used as something else than a genitive, because that would be impossible. It should be noted that “Olas bil” is normally rewritten as “bilen til Ola” (meaning “the car belonging to Ola”) or “bilen åt han Ola”. This is why using it as a genitive marker in substitute for -s (“Ola sin bil”) is generally discouraged. Her sammenfaller “det” og “bilen” (det=bilen), og subjektet er derfor bilen, og eieren er han. Her blir “Det” noe som bilen inneholder, eller “eier”, det kan for eksempel være en hanske. “Dette er en hanske, den er bilen sin”. Kort sagt, når du bruker hans, er det som kommer umiddelbart foran hans det som han eier, når du bruker sin, er det noe objektet foran ordet “sin” som eier noe. Tror jeg da. Det er bilen sin! Det er gutten sin! Som som regel betyr at bilen/gutten har gjort noe bra. Leste kommentar til Erlend, dette er tydeligvis et mer komplekst tema enn jeg trodde. Det er ikke veldig komplekst. “Sin” er genitivformen av “seg”, bøyd i hannkjønn entall. “Hans” er genitivformen av “han”. Anbefalt lesning dersom du strever med fremmedspråk! ‘Sin ‘er refleksivt, dvs. det viser tilbake på subjektet i setningen. ‘Lars vasket bilen sin’ = han som vasker er den samme som han som eier bilen. ‘Lars vasket bilen hans’ = han som vasker er en annen enn han som eier bilen. ‘Sin’ er refleksivt, dvs. det viser tilbake på subjektet i setningen. ‘Lars vasker bilen sin’ = han som vasker er den samme som han som eier bilen. ‘Lars vasker bilen hans’ = han som vasker er en annen enn han som eier bilen. Godt poeng om fransk. Jeg brukte laaang tid på lære å tenke riktig om ‘son’ og ‘sa’ da jeg leste fransk. It took me a long time to learn the difference between ‘sin’ and ‘hans’/’hennes but once it was explained to me in a way I understood, it all became so clear! Lingvisten’s explanation hits the spot but just to have it in English: if the thing being referred to belongs to the sentence’s subject, use sin/sitt eg. Lars gikk på tur med hunden sin. In this case, it is Lars’ dog. If, on the other hand, the dog did not belong to Lars but perhaps someone else who was previously mentioned, you would say Lars gikk på tur med hunden hans/hennes. So hans/hennes cannot refer to the sentence’s subject. 1. Goto memrise.com and enroll in a 500 word vocab list its free, set weekly targets and not daily. Like planting 80 words a week. 2. After you have planted 500 words on the site memrise.com and watered them regularly, now its time to start with a street phrase list. Simultaneously start clustering words for tasks like ordering a burger in mc Donald’s, breaking ice with a girl at the pub etc. This is funny, but it’s all so true! Thank you!! I’m trying to teach myself Norwegian, and this does help~ Wait, where are these schools you talk about? And, I definitely agree with the dialects. I thought I could speak pretty good Norwegian, but then…I heard some songs from Oslo, and I hid in my room for a couple of days. A very enjoyable read and I can definitely sympathise with many of your points along the path to learning Norwegian! Regarding the part where you mention that Norway has two official languages, I feel the need to specify that this is only with regards to the written languages. Many people incorrectly refer to people speaking bokmål or nynorsk but strictly speaking, they are only the written languages while all the wonderful spoken dialects fall under the title of Norwegian. Not to mention that there are several minority languages including Sami that also have official status. I agree that reading is a major benefit in learning a new language. But I believe (based on learning both Norwegian and Italian while living in countries) that it is confusing to start with comics, because there is so much slang. In my view the best choice is “cheap, popular” books that have been translated from English (assuming your mother tongue is English!) You avoid the more complex language used by a native writer; “popular” often means simple phrasing; and most often the content is such that it doesn’t matter if you don’t understand half a page. I started with childrens books from the library, and moved up slowly. Agatha Christie is always a good bet! And I only use a dictionary if I notice that a word often and I can’t figure the general meaning from context. I can agree with the difficulty of learning Norwegian. Sometimes we don’t even understand eachother. I’ve lived in Norway for 9 years and an happy to call myself fluent even though I still feel like an idiot on a daily basis! I’ve read a few of your blogposts, and I’m honestly pleasantly suprised. I dont know if it was intentional or not, but saying that “Nynorsk” is a written language and excluding “Bokmål” from the same (being a written language) would be a tragedy. Even if norwegians from Østlandet think they “speak bokmål,” bokmål is a written* language. You may not want to have this conversation about this with people from Oslo and south, because they honestly believe they are speaking bokmål. The closest you get to actual “bokmål” in pernounciation is in Kirkenes in Finnmark. Which would be one of the northernmost cities on the Norwegian mainland. If you do happen to come into a conversation/arguament about this topic, remind them that they don’t pronounce their words as they are written. In Tønsberg, where I live, and have lived since I was 11, when I moved from Harstad in Troms, they have a saying: “Bilær og båtær som tutær og bråkær…” and this is how they pronounce it. Jeg har lest en del av blogpostene dine, og jeg er ærlig talt positivt overrasket. Jeg er usikker på om det var med vilje eller ikke, men det å si at “Nynorsk” er et skriftspråk, og det å ekskludere “Bokmål” fra det samme (det at det er et skriftspråk) ville vært en tragedie. Selv om nordmenn fra Østlandet tror at de “snakker bokmål,” så er bokmål et skrift*språk. Det er mulig du ikke har lyst til å ha en samtale om dette med folk fra Oslo og sørover, fordi de tror helt seriøst at de snakker bokmål. Det nærmeste du kommer faktisk “bokmål” i uttale er i Kirkenes (uttales K-irk-e-nès with a stressed K) i Finnmark. Altså en av de mest nordlige byene på det norske fastlandet. Hvis du kommer i samtale/debatt i/om dette temaet, minn dem på at de ikke uttaler ordene slik de er skrevet. I Tønsberg, hvor jeg bor og har bodd siden jeg var 11, når jeg flyttet fra Harstad i Troms, så har de en “regle:” “Bilær og båtær som tutær og bråkær…” og dette er måten de uttaler ordene på. Norwegian is probably not QUITE as easy to learn as English, the epitome of easy-to-learn languages, but not far from it. The verb system is ridiculously simple and there’s not much of a case system to worry about. The one thing that is a pain in the neck for, I think, native French and English-speakers alike, is word order. You have to distinguish between coordinating and subordinating conjunctions, as well as which part of the sentence is placed where, and it can be really confusing. Gender is of course irritating irrespective of native language. Case, while difficult and complicated, at least adds clarity, power and efficiency to a language. Gender adds only inconvenience. In Norwegian, there are sort of two-and-a-half genders. My advice is: learn the neuter nouns – they are relatively few compared to the non-neuter ones. Now, the non-neuter ones can all be treated as masculine (or “felleskjønn”, common gender, as it is called in Riksmål). For the most part, this is uncontroversial. You can also consider moving to Bergen, where the -a ending is never used for any noun. As someone who had French in High School, I am somewhat annoyed here because our French books did the same thing! But on the internet you hear: Ta geule connard! I have a feeling that the first one is ever so slightly less insulting than the second. Pingback: Preparing for Norskurs – Live the way you want it.